Want your kid to have the coolest costume on the block this Halloween? Check out these 10 incredible homemade costumes that will surely be showstoppers as you cruise the neighborhood in pursuit of treats! Store-bought ensembles have nothing on these crafty creations that are truly a labor of love and innovation. Each is inherently eco-friendly due to thoughtful design and the use of found objects and repurposed materials to craft the glorious getups. 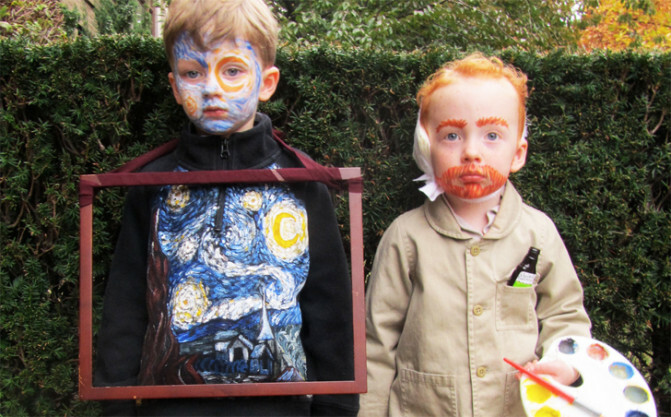 Behold our gallery of wow-worthy costumes to motivate you to fashion your own kids' costume to delight or fright on Halloween night. Seen above, this costume masterpiece of artist Vincent van Gogh and one of his famous works of art, Starry Night is truly exemplary. No detail is spared, including van Gogh's famously severed ear being wrapped in gauze. See how to recreate this ingenious costume here. Who doesn’t love a minion? 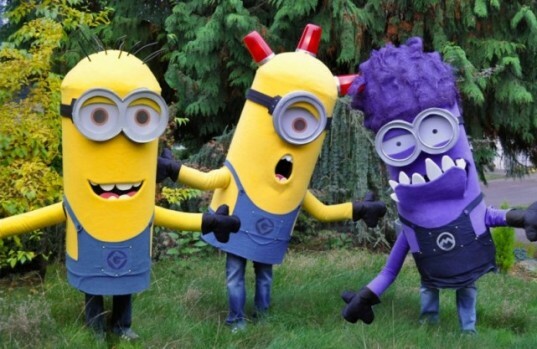 These fantastic costumes were a huge hit on Halloween (no surprise there! ), and the creators also continue to wear them to pediatric hospitals in the Seattle area to bring a smile to patients’ faces. Professor Gru would certainly approve. 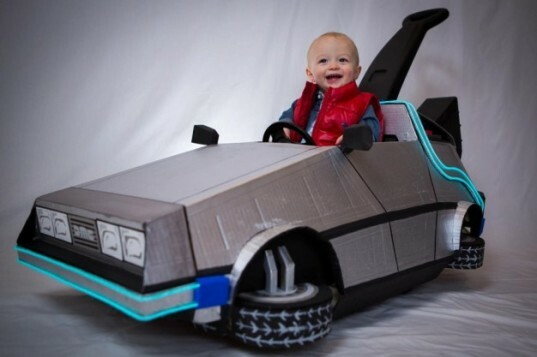 The glory days of Back to the Future live on in this chuckle-inducing costume of a baby Marty McFly and his DeLorean push car, which probably wouldn’t survive a blast to the past as it’s constructed from cardboard. 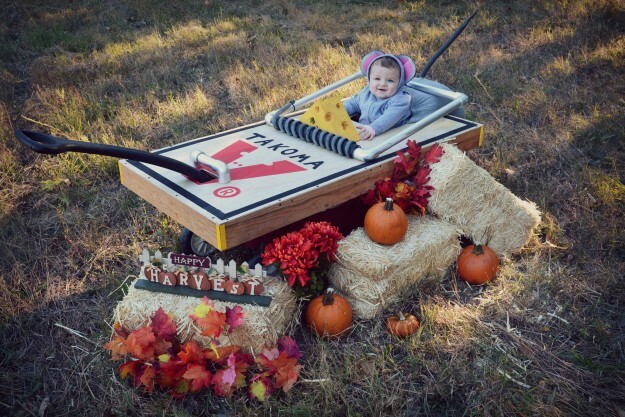 What a great way for a baby to get around on Halloween night! This cutest ever little mouse is happily caught in a piece wood painted to resemble a trap and then laid atop a wagon. The mouse’s cute ears are compliments of bra cups. Click below to learn about additional eco details of this costume’s construction! This throwback to the beloved Cabbage Patch Dolls that debuted in 1978 evokes a big dose of nostalgia! The costume creator thought her baby looked like a doll, so she framed her adorable face in a cardboard box she painted to look like the toy’s packaging and set the design on top of her little girl’s stroller! Voila! Why wait for December for your Elf on the Shelf to arrive when you can pay homage to the super popular little guys by dressing as one for Halloween? Again, a cardboard box was fashioned into a festive mantle complete with homemade Christmas decorations, and red leggings stuffed with fluff complete the elf’s task to sit atop the shelf! Starbucks fans will delight in this frilly pink strawberry Frappuccino costume! The mom who created this whipped cream heavy outfit provides great, detailed instructions about the process. If you’re more of a coffee fan/drinker, simply swap out the pink felt for a mocha hue! 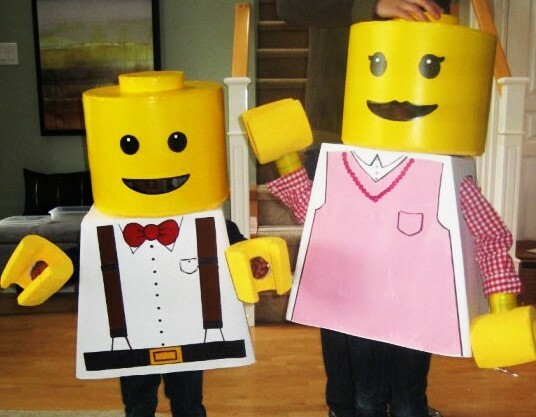 Everything is awesome when it comes to these LEGO minifig costumes! It’s amazing what one can do with some unassuming cardboard, Styrofoam and paper! The costumes took 12 hours to bring to life, which gives you plenty of time to crack the code on constructing these beauties! If your kiddo would rather swap the trademark LEGO minifig permanent happy face for a jagged-toothed evil zombie look, then this is the costume for him/her. Made from recycled foam rubber camping mats, this costume is sure to receive many compliments! 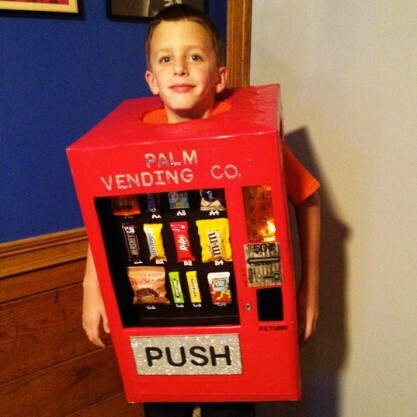 This fantastic vending machine costume actually lights up via LED lights and the wearer can place his/her candy gleaned from trick or treating in the return slot. Of course, revelers may flock to the candy contained behind the plexiglass housing of this crafty creation! STAY TUNED FOR OUR UPCOMING ANNOUNCEMENT OF INHABITOTS’ GREEN HALLOWEEN COSTUME CONTEST! Who doesn't love a minion? These fantastic costumes were a huge hit on Halloween (no surprise there! ), and the creators also continue to wear them to pediatric hospitals in the Seattle area to bring a smile to patients' faces. Professor Gru would certainly approve. The glory days of Back to the Future live on in this chuckle-inducing costume of a baby Marty McFly and his DeLorean push car, which probably wouldn't survive a blast to the past as it's constructed from cardboard. What a great way for a baby to get around on Halloween night! This cutest ever little mouse is happily caught in a piece wood painted to resemble a trap and then laid atop a wagon. The mouse's cute ears are compliments of bra cups. Click below to learn about additional eco details of this costume's construction! 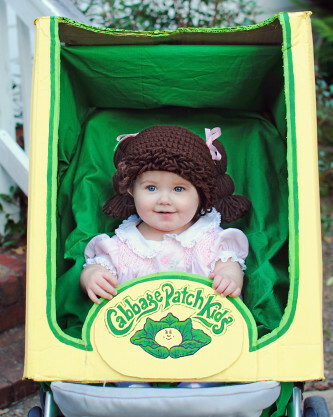 This throwback to the beloved Cabbage Patch Dolls that debuted in 1978 evokes a big dose of nostalgia! The costume creator thought her baby looked like a doll, so she framed her adorable face in a cardboard box she painted to look like the toy's packaging and set the design on top of her little girl's stroller! Voila! 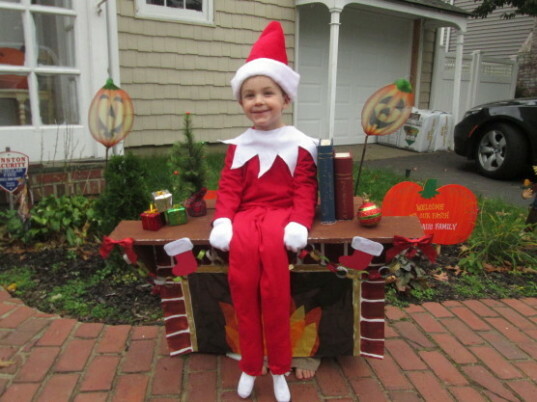 Why wait for December for your Elf on the Shelf to arrive when you can pay homage to the super popular little guys by dressing as one for Halloween? Again, a cardboard box was fashioned into a festive mantle complete with homemade Christmas decorations, and red leggings stuffed with fluff complete the elf's task to sit atop the shelf! 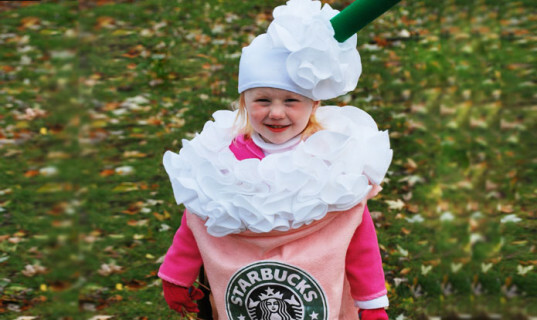 Starbucks fans will delight in this frilly pink strawberry Frappuccino costume! The mom who created this whipped cream heavy outfit provides great, detailed instructions about the process. If you're more of a coffee fan/drinker, simply swap out the pink felt for a mocha hue! 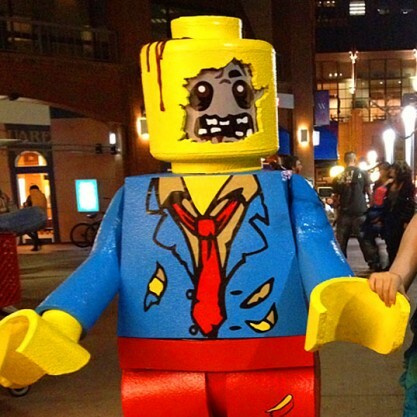 Everything is awesome when it comes to these LEGO minifig costumes! It's amazing what one can do with some unassuming cardboard, Styrofoam and paper! The costumes took 12 hours to bring to life, which gives you plenty of time to crack the code on constructing these beauties!